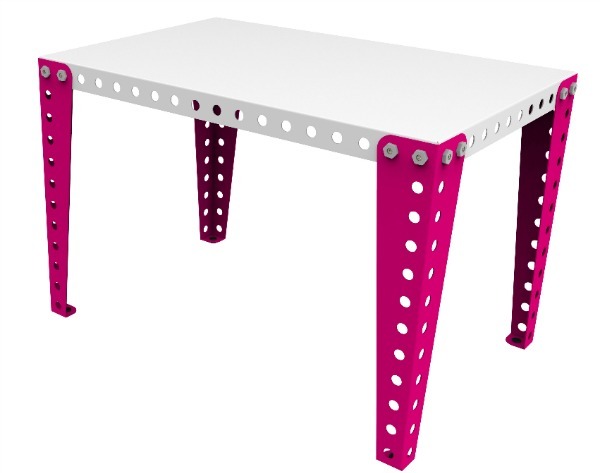 Meccano furniture for kids? Yes please! Step aside, Ikea plywood flat packs, you have some competition from an ultra fashionable and undeniably nostalgic alternative. Meet Meccano Home, the innovative and modern twist on the Meccano build and play sets. Yep, you guessed it, you get to build the furniture yourself, just like an oversized Meccano set. And who could forget the original Lego alternative – indestructible pieces that made you feel like a true mechanic or engineer. Meccano Home is the brain child of revered contemporary furniture designer Vincent Boutillier and engineer Christophe Piquemal, and has been brought to life through a talented team of Meccano designers. Like the original concept of toys that were flexible and expandible, Meccano Home have created evolutionary, modular pieces of furniture that are perfectly suited to a busy family’s lifestyle. This children’s desk is just one piece in an exciting new collection of children’s furniture from Meccano Home. Fit for either a retro or modern styled room, the only problem with this desk is making sure it is screwed tightly enough to deter budding builders from getting their tools out when they are supposed to be studying. Made of painted steel, the children’s desk comes with a white table top top, four legs in your choice of four bold colours as well as screws and nuts. It measures 90cm long, 60cm wide and 60cm high. Currently unavailable in Australia, Made In Design sell the desks for £397. They do ship the desks and other Meccano Home furniture pieces internationally but as you can imagine, steel isn’t the lightest or most affordable product to ship overseas. Here’s hoping an Australian distributor picks them up soon! Like furniture kits inspired by children’s toys? 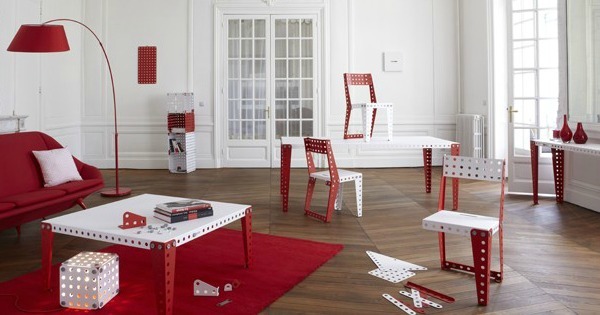 Then take another look at these Lego-style DIY furniture kits from Olla.